what does sea salt spray do for your hair? Sea salt sprays are the secret product you need if you want to learn how to make beach waves easily. Love Beauty and Planet Coconut Milk & White Jasmine Salt Spritz Texture Spray is filled with ingredients that mimic the ocean’s effect on your hair. This salt spray in particular is infused with coconut milk and provides a lightweight texture to your strands. Filled with a touch of salt and the scent of white jasmine, it moisturizes your hair while adding texture. You can use sea salt spray when you’re styling dry hair! Simply spritz it through dry hair and scrunch into locks for a messed up texture that you can achieve even when you're not catching a wave! Or, spritz sea salt spray on damp hair to texturize your hair and give it a subtle, voluminuous look. It’s all about trial and error and finding the right amount for your particular hair type. Spray enough sea salt spray to cover all of your strands but try not to oversaturate your hair in the process. Too much product will weigh your hair down and counteract the lightweight texture you’re aiming for. If you find salt spray leaves your ends over dehydrated, layer on some leave-in conditioner, detangler or serum to soften the hair, while benefitting from the texture. 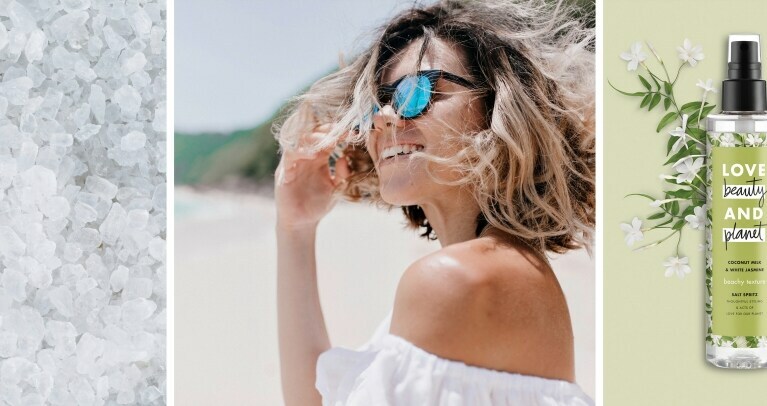 Short-haired girls can use sea salt spray to add texture and lift their roots, while long-haired ladies might find that too much product will weigh their hair down. If you want texture through long hair, be sure not to overload too much into the roots, these products works best on mid-lengths to the ends. However, if you have flat roots and want to dry them out for a kick of lift, we recommend spritzing some salt spray into your roots when wet, as you would do a root-boosting products. But, if you are unsure where to start applying from your mid-lengths to ends is generally a safe zone. The best part about using a sea salt spray is how quickly you can achieve that beautiful, beachy texture.